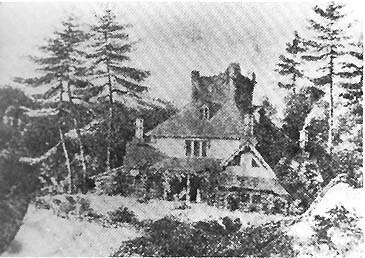 This sketch of the famous Hornby Lodge was done by Thomas Cole when he stayed at the Lodge in 1841. The Lodge was the home of Elisha Johnson, a contractor working on the Genesee Valley Canal. Mr. Letchworth acquired a photographic copy of Cole's original sketch. This copy hung in his original Genesee Valley Museum and later in the Glen Iris Inn. For more information see the Glimpse of Hornby Lodge.